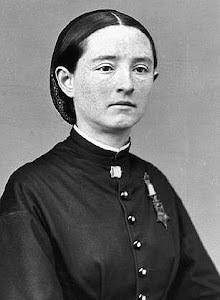 Lt. Elizabeth Whiteside, attempted suicide again, but failed and is still here. Thank God! 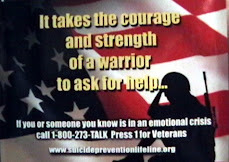 The suicide rate among US soldiers has reached its highest level since records began almost 30 years ago. Last year, 121 active members of the army took their own lives, up 20% on the previous year. Thirty-four of last year's deaths were in Iraq, compared with 27 in 2006. Also on the rise are attempted suicides and self-harm. The number of US soldiers who tried but failed to kill themselves or who deliberately injured themselves rose to 2,100 in 2007, up from 500 in 2002. 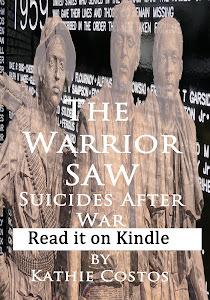 When the Washington Post reported on the suicides and the attempted suicides of US forces, the world was watching as they have since the beginning of deaths following the Vietnam War. The entire world has been watching and waiting for America to take this seriously and take action. While our healthcare as a whole is sorely lacking, our doctors, scientist and psychologists have been leading the way in many treatments. So why not this one? While the military has been focusing on "winning" the "war" which is really two occupations producing higher and higher deaths, they fail miserably at focusing on what these two occupations are doing to the US forces they sent to risk their lives. In the silent suffering of the American military families, we also fail to see how this is all effecting them. Has anyone tracked how many divorces or suicides or suicide attempts they have made since this began? Why "silent suffering" term is used? Because no one is paying attention to them. 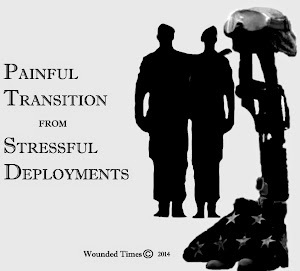 They are key to the survival and healing of the wounded when they come home. They are key to the families they are raising. Why are they forgotten? 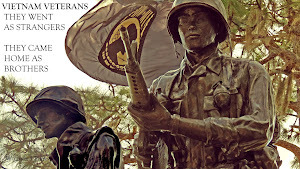 When my husband came home from Vietnam, his father, a WWII veteran, told him to get over it. His mother opted to ignore it. By the time we met, he had been home for 10 years. 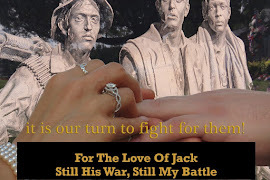 The signs of PTSD were there to the point where my father, a Korean War veteran, said Jack had shell shock. The hunt for the invisible killer inside of him began. What I didn't know was that Jack had mild PTSD to the point where he could function enough to go to work, be sociable enough that he was willing to enter into movies and clubs, but not enough to stay. He was able to talk a lot more to me, but still had a hard time talking to others. His nightmares, flashbacks and physical symptoms left him drained but not to the point where he was unable to do things during the day. I accepted the oddities of him as "quirks" finding some of them cute. Even with all of this the day we got married 23 years ago, I married my best friend. It was not until a secondary stressor hit that our world took a nosedive and I was suddenly married to a man I no longer knew. This is happening all across the country today. Some come home with PTSD in a mild form and function but their family members can see the changes. They can see the times when the veteran has a flashback but if they don't know what it is, the connection between combat and the zone out are not made. They can see the odd reactions to sudden moves or noises, they can become shocked with the mood swings and wonder what they did to set it off. They notice it all but if they don't know what they are witnessing first hand, they are helpless to do anything about it. It is damn near impossible to get them to go for help. Even knowing what I did back then it took years to get Jack to go for help. They go into a denial stage where they know there is something wrong with them but refuse to come to the conclusion they need help to get back to "normal" and seek to deal with it in their own way. They turn to self-medicating to kill off feelings they don't want to feel. This is only the PTSD part of all of this. The families need support to go through the stress of separations and being a single parent over and over again. They have to deal with the loneliness as well as the constant worry while their spouse is deployed, risking their lives and facing death or serious wounds. This adds to the stress of the families. When the spouse, son or daughter comes home, there is a euphoria epidemic taking over the entire family. The relief that they returned covers the problems that are there. Then they enter into their own state of denial that with time, they will get over what they went through and everything will go back to normal. The family cannot see that there is nothing normal about combat. 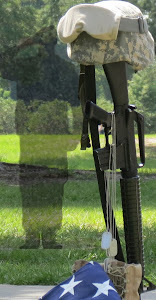 There needs to be a nation wide emergency alert to address all the issues the soldiers face along with their families. We know the redeployments increase the risk of PTSD and increase the pressure on the families at home. We know financial problems associated with the Reservists and Guardsmen make all of this worse for them. We know that early intervention for PTSD works best. We also know that medications need to be monitored and there has to be therapy included in on addressing PTSD for it to work. We know all of this because of our researchers but we do none of it. When will this nation take the lead on this? The rest of the world is watching our troops and their families suffer. Do we really want to be considered leaders in needless suffering instead of healing? On MSNBC Countdown tonight, Keith Olbermann showed homeless veterans showing up from a shelter to let Bill know they were real and yes, homeless. Keith did such a fantastic job on his commentary, I almost forgot to post it. Now I can't remember the woman's name who said she delivered a petition to O'Reilly with thousands of signatures on it. Somehow I doubt O'Reilly offered them some of his pocket change which could have kept the entire group fed for about a year. I'm sure they'll be more on this tomorrow when Olbermann updates his site. You know there will be more posting on YouTube about his comment. Yesterday, we organized a group of vets to deliver your 17,000-signature petition to the FOX building in NYC, and it went better than we could've ever imagined. The story was even featured on Keith Olbermann's show last night... the very same day! You are having a huge impact with this campaign, in just three years we have dramatically changed the public's perception of FOX. Election time is around the corner, and we all know what's going to happen at FOX. The vets in NYC who took the lead on this were mad and ready to do something (speaking as a New Yorker, I can attest to good old-fashioned NYC disdain for truthiness). Carol Gardener, the executive director of Fitzgerald House, which provides transitional housing to homeless vets, is so passionate about taking care of these heroes that she would not be deterred. And Jonathan and Nichole worked hard and fast to get them all the support possible, from getting the petition printed to a press release to anything else they needed. And then we get the reports from Olbermann, the Huffington Post, and the NY Daily News, with more on the way! It was a wonderful day, and now the blogs and other media are picking up the story. All the best,Robert Greenwald, Jonathan Kim, and the crew at Brave New Films. The questions is, if I was right 25 years ago after reading what the experts had to say back then, what took these people so long to catch up? How do multiple deployments affect soldiers and their families? The special issue of the journal features commentaries written by mental health professionals, most of whom are members and veterans of the U.S. armed forces. They each write about aspects of the study’s findings, for example, how early interventions are critical in avoiding stress injuries and subsequent long-term mental health problems, including such things as: posttraumatic stress disorder, depression, substance abuse, family violence and suicide. The commentaries will enable readers to more effectively understand and help the brave combatants and their families return to civilian life with excellent prospects for resilience and post trauma growth. These reports are great but they are not new. Why is it we have not stopped the redeployments knowing this? Why is it we have not made sure they all got treated early? For all they suddenly re-discover, look at all the time lost on what needed to be done to FIX IT ALL! 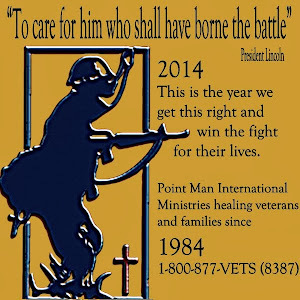 MOUNT VERNON — Point Man Ministries is organizing a local chapter for Knox and the surrounding counties of Morrow and Coshocton to help veterans suffering from Post Traumatic Stress Disorder. Veterans of the Army Reserve and the National Guard are seeing PTSD rates as high as 40 percent, said Larry Waltman, spokesman for the newly organized chapter. Typical symptoms for PTSD include anger, insecurity, alcohol or drug abuse, or an inability to adapt with job or family. Because the reserve and guard members return to a civilian life, isolated from other veterans with similar experiences, they are more prone to PTSD symptoms, said Waltman. He said the highest rates are in returning Army reserve and Army guard combat service support units such as transportation, supply, aviation, medical and military police, among others. The shooting happened very late Monday night outside a west Lawton club called Alabis. Lawton police say 27 year old Ira Easterling, was shot after an apparent argument. He was rushed to the hospital in Lawton, but died as he arrived. Captain Will Hines says after an exhaustive investigation a suspect has been identified. "Through the investigation we have come up with a suspect. At this time, we don't have the suspect in custody." Hines says the investigation has revealed the suspect is connected to the army base. "He has some ties to a person in the military. Whether he is a military dependent or not is really unclear at this time." When will they notice us falling into darkness? Officials on Wednesday identified the soldier who was found dead in the Warrior Transition Unit barracks at Fort Huachuca, Ariz.
Pfc. Eli Mundt Baker, 22, of Foothill Ranch, Calif., was undergoing advanced individual training at Fort Huachuca. On Monday morning, military police and emergency medical services responded to a 911 call from a noncommissioned officer in the barracks. Baker was pronounced dead at the scene at 9:12 a.m.
from the VA Medical Center which is located across the street. at a time. We hope there is a way to keep this important program going. Just one who is part of a staggering rise in suicide attempts by soldiers, Lt. Elizabeth Whiteside was admitted to the psychiatric lockdown ward at Walter Reed Army Medical center after trying to kill herself earlier this week. She had already been nearly court-marshalled for an earlier suicide attempt. Basic training to learn all about America's fighting force. Armen Keteyian and his investigative team keep you informed daily on their blog. (CBS) CBS News broke the story of the epidemic of suicides and attempted suicides among veterans in November. And tonight, new Army figures illustrate how serious the problem has become among active military servicemembers. It's part of an exclusive report that will appear in Thursday's Washington Post and on washingtonpost.com. CBS News national security correspondent David Martin has one soldier's harrowing story - and her struggle to get help. Lt. Elizabeth Whiteside was admitted to the psychiatric lockdown ward at Walter Reed Army Medical center after trying to kill herself earlier this week, Martin reports. "She took two weeks worth of medicines - four different medications... and she took them all at once," her father, Tom Whiteside, said. He holds a note she left, reading in part: "I'm very disappointed with the Army." He says her suicide attempt was brought on by the stress of waiting to find out if she would be court-martialed for an earlier attempt to kill herself. "It became so distressing to my daughter, it just drove her over the edge and, um, she attempted to take her own life," Whiteside said. Lt. Whiteside is the latest in the epidemic of attempted suicides and self-injuries by soldiers. WHAT THE HELL ARE WE PUTTING THEM THROUGH AND WHY ARE WE PUTTING THEM THROUGH HELL AT ALL? 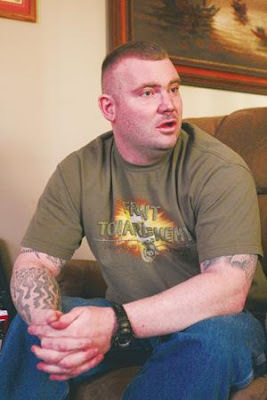 Paul Miles returned from Iraq needing help with the death in his head. He got prison. The patient came to Brentwood Hospital in handcuffs, escorted by Nacogdoches police. Paul Miles, 22. Something about making bombs and threatening to kill kids. He tested negative for drugs at Nacogdoches Memorial, and his parents had asked if he could be brought here to Brentwood in Shreveport. During intake, he told the staff, "I have not had thoughts of hurting kids in years." When he was passed on to Dr. Greg Seal, the treating psychiatrist, Miles was rambling, illogical. "I don't want the cops to die," he told Seal. "I needed new boots." Seal got some of the patient's basic background: Five years in the Texas Army National Guard. Spent 2005 in Iraq. No history of physical, sexual or emotional abuse. No psychiatric history reported. Currently a student at Stephen F. Austin State University in Nacogdoches. Miles and a roommate lived in an off-campus apartment where, about eight hours earlier on this morning of November 20, 2006, police found gunpowder and PVC pipes. Federal agents were combing the place now. Neighbors were evacuated. ABHA, 31 January 2008 — A 26-year-old soldier committed suicide by shooting himself while on duty last Friday. The young man in uniform was found dead in his car. His family raised the alarm that he was missing after he failed to return home after night shift. A forensic expert said the death was most likely suicide and that no one else was involved. The soldier’s family said the man might have killed himself as he had a history of drug abuse. FRANKFURT, Germany — A memorial service for a U.S. soldier who died in Germany will be held this week, the U.S. Army said Wednesday. Pfc. David W. Webb, 26, of Duncanville, Texas, was taken to the Leopoldina Hospital in Schweinfurt, Germany, Sunday morning and pronounced dead by German medical authorities, the Army said. The cause of his death was being investigated. Webb was assigned to the 1-18th Infantry Battalion, 2nd Brigade, 1st Infantry Division in Schweinfurt. A memorial service will be held at the Ledward Barracks Chapel in Schweinfurt on Thursday. Webb's survivors include his father and sister. These are our soldiers. Why do we forget that? The photo is of troops in Iraq not the subject of the following piece. Self-medicating to kill off what they do not want to feel again. 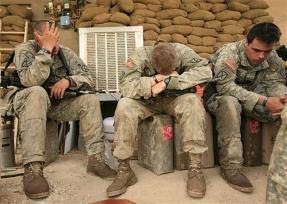 OLATHE, KAN. -- A military study reached a new conclusion about returning soldiers who have memory loss, irritability and trouble sleeping. The cause, more often, may be due to depression and post traumatic stress disorder than blast related concussions. Olathe mom Cindy Goforth knows about the problem first hand. She has two sons. One who's back from Iraq, 19-year-old David, and the other who's serving his third tour there. She said her younger son is in jail because of PTSD and she hopes the new study will help convince him he can be treated. 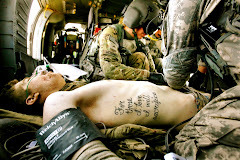 "The night before he come home on R and R one of his best buddies was killed and he did not handle that well. He didn't handle that one well at all," said Goforth. That was in October. He was supposed to go back in November, but went AWOL at the airport. "Did he ever get mental health treatment when he came home? No, of course they teach them to be Army strong. Well, they're Army strong. The only problem is these kids don't realize they've got problems," said Goforth. Goforth said that her son's PTSD was so bad, that David was so sensitive to noise, that simply turning on a computer, a sound you probably barely notice, caused him to the hit the ground for cover. Angry and constantly unnerved, she said David turned to drugs when he got home. A week ago, he was arrested on drug charges. "I've told my son that if I get you out of there, you aren't coming home. You're going to the VA. Any arguments, I'll leave you there. He's like 'Mom, I'll go to the VA,' Now, I'm getting the point of what you were saying," Goforth said. This is why I do what I do. This is why there are over a thousand just like me doing what we do. David Goforth didn't know what was wrong with him. Maybe he took it as if he would "get over it" and go back to the way he was before. Maybe he thought that if anyone knew what was going on in his mind, they would lock him up. After all, when they don't know what PTSD is, this is what usually happens. When they do finally understand what PTSD is and that is a normal reaction to all they went through in the abnormal world of combat and carnage, they seek help but end up in a pile of claims 650,000 deep with 147,000 more on appeal. These are wounded veterans being tortured by the system unable, unprepared thanks to Nicholson and the Bush Administration not valuing the men and women they sent to risk their lives. Advanced technologies such as artificial intelligence could help the Veterans Affairs Department reduce a backlog of disability claims that has spiked past 1 million, according to computer experts and veterans advocates. The Veterans Benefits Administration, which processes the claims, has a backlog of 650,000 pending claims and another 147,000 that are under appeal and working their way through a process that "is paper intensive, complex to understand, difficult to manage and takes years to learn," Rep. John Hall, D-N.Y., chairman of the Veterans Affairs Subcommittee on Disability and Memorial Affairs, said at a Jan. 29 hearing of the House Veterans Affairs Committee. Training an employee to rate VBA claims can take two to three years and many leave within five years, Hall said. Experienced raters can adjudicate only about three claims a day, spending two to three hours on each claim. He said the VA should consider the use of artificial intelligence technologies, such as automated decision-support tools that can determine disability payments, which would speed up claims processing. Computer experts who testified at the hearing said technology exists today that can automate the claims process and eliminate the backlog. VBA repeatedly loses paper records submitted by claimants. Robin Cleveland, wife of retired Marine Gunnery Sgt. Tai Cleveland, told the hearing that since November 2005, she has submitted multiple copies of Tai's medical record and was told that the VBA could not find the records and she needed to resubmit them. She said her husband, a paraplegic after injuries incurred in August 2003 during a hand-to-hand training exercise in Kuwait, only started to receive benefit payments this month after Congress intervened. Years ago, when veterans came to me to understand PTSD, I would explain it to them and their families, get the idea of it having anything to do with them out of their mind, support them until they were ready to go for help and then send them to it. Now I have no place to send them. This is especially hard for veterans in rural areas of the country. Help is often too far away. The suicide prevention lines are helping. The veteran can reach out in the middle of the night to talk to someone but unless they get into treatment with an approved claim, they find themselves either being billed for their treatment or being pushed back so that veterans with approved claims can be seen. 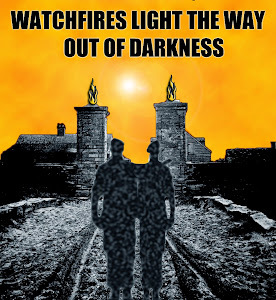 Between the time they come back and understand what PTSD is, vital time is lost. The sooner they begin treatment PTSD stops getting worse. It's like an infection that spreads untreated. The system is adding stress to them on a daily basis as they have to wait to have their claims approved. It's like a knife in their back when their claim is denied and they have to file an appeal. With the changes in the new VA Bill providing five years of free care to returning forces, this will help in having them treated without charging them but it does not address the income stress they and their families face when most of the time, they are unable to work in the condition PTSD puts them in. 650,000 backlogged claims and 147,000 on appeal means they are just one of 797,000 veterans suffering for their service to this country and countless family members suffering right along with them. Brent Martin's story should, and could, have been a story of quiet success. The 23-year-old had struggled in his short life with his learning difficulties, and those struggles more than once had become so serious that he had been compelled to spend long periods in psychiatric hospitals. Even a generation ago, such a history might have condemned a young man to an institutionalised life. But we are more enlightened now, in theory at least. Martin, released in spring of last year into the care of his family, was recognised as a man who was quite capable of living independently, supporting himself through work, paying his taxes, living and loving like the equal member of a civilised society that he was, or should have been. In August last year, he was winning. He was about to start a new job as a landscape gardener, about to move into a flat and live on his own for the first time, and enjoying the time that he spent with his girlfriend. Then, on 23 August, he was chased for a mile and a half through two estates in Sunderland. Repeatedly, he was set upon by 21-year-old William Hughes, and two boys of 16 and 17. Between them – they had trained as boxers – they bet £5 that one of them could knock him out with their fists. Their attacks got more frenzied until they started kicking Brent, and stamping on him. They removed his lower clothing, at the end, and took photographs of their bloodied selves to mark the occasion. Brent died in his mother's arms of a massive head injury. He had been so badly beaten that his uncle did not at first recognise his face. Hughes and the 16-year-old admitted murder, while the 17-year-old was found guilty of murder at Newcastle Crown Court last week, after telling witnesses that "he was not going down for a muppet". All three have been warned that they face mandatory life imprisonment, when sentencing takes place next month. Practical counter-measures are needed when such additional stresses are being perpetrated against already vulnerable people in such a widespread manner. The advances that have been made towards the full participation of disabled people in everyday life are still fragile, and they need to be defended. A concentrated effort to reduce the barbaric lack of stigma around such a cowardly form of criminality is absolutely essential. It doesn't matter what country you live in because it happens here too. Remember the homeless people killed here in Orlando and other parts of the country. Why do they do it? Morning Edition, January 29, 2008 · Army officials in upstate New York instructed representatives from the Department of Veterans Affairs not to help disabled soldiers at Fort Drum Army base with their military disability paperwork last year. That paperwork can be crucial because it helps determine whether soldiers will get annual disability payments and health care after they're discharged. She says the officers who asked the VA to stop helping Fort Drum's soldiers were part of what the Army calls a "Tiger Team"— an ad-hoc group assigned to investigate, in this case, medical disability benefits. A few minutes ago on the floor of the senate on CSPAN Senator Richard Burr of North Carolina described a bill he is introducing. I did not get the number. This involves PTSD recovery in not only getting treatment but immediate financial aid to the Veteran through the use of stipends upon signing up for the program - provided he does not submit a claim for disability during the treatment and until the treatment is completed. With financial incentives for completing milestones during the intensive treatment. Does not stop the Vet from applying after the treatment. In his words, what they are doing now is not working and backed up by Dole study as well as the Disability Commission findings. For those already with disability the stipends would be 1/3 of those that have never sought treatment or disability provided no request for reevaluation is made during the intensive treatment. January 29th, 2008 - WASHINGTON, D.C. - U.S. 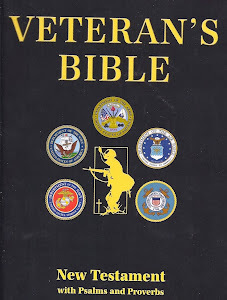 Senator Richard Burr (R-NC) today praised President Bush’s signing of H.R.4986, the National Defense Authorization Act for Fiscal Year 2008, which contains several improvements to veterans’ benefits. The legislation strengthens the relationship between the Department of Veterans Affairs (VA) and the Department of Defense (DOD), enhances education benefits for National Guard and Reserve members, and expands benefits and research programs for veterans suffering from traumatic brain injury (TBI). Under the new law, National Guard and Reserves who have served in Iraq and Afghanistan can now receive full education benefits after three total years of active duty service. They can also participate in the “buy-up” program, which provides up to $5,400 in additional education benefits. With these changes, Guard and Reserve members may receive over $37,000 in education benefits. Coupled with additional amounts paid from DOD for critical or hard to fill skills, their benefits may cover over 90% of the cost of a four-year public college education, including tuition, fees, room, and board. National Guard and Reserves may also participate in the Accelerated Payment Program, which pays for up to sixty percent of the cost of short term, high cost vocational training. The new law also enhances services and benefits provided to veterans with traumatic brain injury. It requires the VA to develop individual treatment plans for all patients with TBI and develop a long-term care program for post-acute TBI patients. It also allows recently separated combat veterans to receive priority access to VA health care for five years following separation, up from the two years they currently receive. If he cared wouldn't he show up more often? When U.S. Sen. Richard Burr of North Carolina assumed the GOP leadership position on the Senate Committee on Veterans Affairs last week, he came to it with a bit of a gap -- he had attended fewer than half its hearings in recent years. Others on the panel have worse attendance records. Sen. Lindsey Graham, R-S.C., a member of the military himself, only showed up three times at veterans committee hearings between the start of 2005 and May 16, 2007, according to a Charlotte Observer review of the published proceedings from 44 meetings. Burr's attendance -- he has gone to 20 meetings -- is about the middle of the pack. A few senators attended most of the meetings, led by former Chairman Sen. Larry Craig, R-Idaho, who attended 43 of the 44 hearings, and some senators attended only a few, such as Sen. Arlen Specter, R-Pa., who attended two. But it happened while they were in charge and ignored the problem when they could have saved lives. Why all of a sudden do they forget they had all the power to act for the sake of the troops and blew it? Welcome! As the Ranking Member on this committee, I want you to know that Republicans are working with our colleagues on the other side of the aisle to ensure America’s veterans are getting the care and services they deserve. We’ve made great strides recently. For example, funding of key programs serving veterans has risen dramatically in the past few years and VA health care has recently been ranked as among the best care in the nation. There is room for improvement, of course, and I am dedicated to working with my Senate colleagues to improve the service and care our nation’s veterans receive. Please contact me at (202) 224-2074 or send me an email if you have any comments or suggestions on how we can improve our service to veterans. He asked to be contacted, so why not do it? A soldier undergoing advanced individual training was found dead in the Warrior Transition Unit barracks Monday morning at Fort Huachuca, Ariz., according to a press release. The soldier’s name has not been released, pending notification of family. Military police and emergency medical services responded to a 911 call from a noncommissioned officer in the barracks. The soldier was pronounced dead at the scene at 9:12 a.m.
National Guard troops have been reporting with rates of 50% with PTSD for two years now. They have to live with giving up their jobs and incomes in order to be deployed over and over again. Many of them face financial troubles beyond what the regular military face. This adds to their stress level. A FORMER soldier who suffered from post-traumatic stress disorder died as a result of an accidental overdose. Mr Michael Cartmell (38) was found collapsed at his home in Cuerdale Street, Burnley, on May 16th last year. An inquest at Burnley Coroner's Court heard he had been drinking and had taken a prescribed anti-psychosis drug. The hearing heard how Mr Cartmell had lost a friend while serving with the Army in Northern Ireland. He had served with the Queen's Lancashire Regiment and Scots Guards. The Express reported last May that Mr Cartmell had fought a 14-year battle with post-traumatic stress disorder. He had attended Briercliffe Primary and Mansfield High Schools and grew up in Briercliffe. He developed an enthusiasm for the military from a very early age and joined the Sea Cadet Corps aged 12. Pathologist Dr Abdul Al-Dawoud, who conducted the post-mortem examination, said toxological tests showed Mr Cartmell had a level of alcohol in his system above the legal driving limit. He also had six times the therapeutic level of the drug quetiapine. Dr Al-Dawoud gave the cause of death as the combined effect of the two. If you have PTSD or know someone who does, do not mix alcohol with medicine. It alters the medication and makes the depression worse. NEW YORK (CNN) -- Sgt. Ryan Kahlor has the same nightmare every time, a vision of walls painted in blood and fat, and men on top of houses, throwing pieces of Marine's bodies off rooftops. It's a vision he can't shake, because he lived through it while deployed to Iraq last year. "I have nightmares. I dwell on it. I think about it all the time," said Kahlor, 24. "Staying asleep is hard. I associate a bed with the dreams I have. My parents think I'm crazy, but I sleep better when I'm on the floor." Kahlor has post-traumatic stress disorder, which can develop after surviving a traumatic event in which a person is physically threatened or injured. He also experienced concussions while surviving four explosions during his 14 months in Iraq. He said these events left him with a detached retina, vertigo, memory problems and dizziness. Five percent of the 2,500 soldiers surveyed by Walter Reed Army Institute of Research said they had concussions in which they lost consciousness during combat. Forty-four percent of these soldiers ended up with PTSD. Researchers were surprised to find symptoms normally associated with concussions -- headaches, dizziness, irritability and memory problems -- were actually related to PTSD or depression. "It isn't the combat exposure or physical injury, it's the PTSD that seems to drive these symptoms. That's a surprise," said Joseph A. Boscarino, Ph.D., who studies PTSD at the Geisinger Center for Health Research in Danville, Pennsylvania. "You would expect they would have these other symptoms related to traumatic brain injury, that maybe they have a permanent injury, but it's explained by whether they have PTSD or depression." 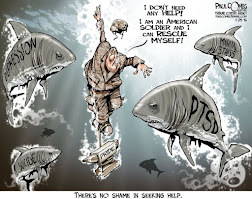 About 8 million American adults have PTSD. A 2003 New England Journal of Medicine Study found that 15 percent to 17 percent of Iraq and Afghanistan veterans were suffering from PTSD, and more than 60 percent of those showing symptoms were unlikely to seek help because of fears of stigmatization or loss of career advancement opportunities. As of June 30, 2007, the Department of Defense reported 3,294 soldiers in Iraq and Afghanistan suffering from traumatic brain injuries, or TBIs. Bomb blasts caused nearly 70 percent of those TBI cases. Dr. James Kelly, a neurology professor at the University of Colorado and a co-author of guidelines the military uses to identify traumatic brain injury, expressed concerns that doctors will attribute lingering health problems to psychological issues. "I think if people misunderstand or overextend beyond what this survey shows, they could dismiss true brain injury features as psychological only," Kelly said. "It would be a terrible disservice to our military for that to happen." I had TBI at the age of 4. I was pushed off a slide and hit concrete head first. My scull was cracked and I had a sever concussion. I was in the hospital for a week. It didn't cause nightmares. It didn't cause me personality to change. It did give me headaches and to this day sometimes my head feels as if it will just explode. My Mom said that my brain worked differently after. I was able to learn how to spell quickly before that and after, it wasn't so great. For a person who loves to write lacking the ability to spell correctly, it's a terrible thing. I thank God for spell check so that I stopped wearing out dictionaries. From all indications it is two different problems they are dealing with. TBI, damage to the brain itself, shouldn't cause character changes to levels we are seeing. 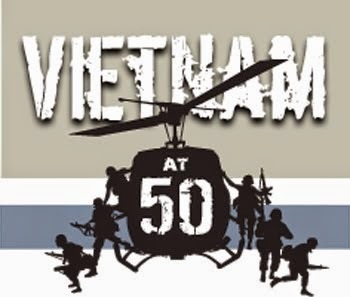 My husband has PTSD and was around a lot of explosions in Vietnam. From the studies I've read and living with both conditions, it is both conditions in many of these veterans and they need to look at both just as seriously and as separately as they need to be. Bill O'Reilly, Blowing Smoke on the "O'Reilly Factor"
It drives me crazy when Bill O makes the statement on his show that his organization does "extensive research" to support the comments made on his daily "O'Reilly Factor" cable TV show. In his program last week, after taking back his comment that "there aren't that many homeless vets out there anyway", he agreed he had learned that there were over 200,000 homeless US vets. But then he added "that it was well known, most of the homeless vets are drug addicts or are mentally ill". Well Bill, you blew it again. Now, let's do some real investigative work and find out what the real information is on the homeless vets that have been fighting for the freedom of all Americans. First, let's look at the funding for the US Veterans Administration (VA) that support all US vets. The VA is not an on-going, funded entitlement program like Social Security or Medicare that automatically receives increases as inflation and the cost of living increase. Instead, the VA must approach the Congress and the Administration on an annual basis and submit a budget request which usually gets cut before it is approved for funding. To put the VA's 2008 Budget into perspective, let's compare the 2008 Budget to the overall costs of the War in Iraq (to date) and to the War on Terror. I'm posting this all because he needs help and also because he is not the only one this is happening to. LEE COUNTY, Fla. - Vince Crespi and his finance are out of food and almost out of a home because they're out of money. "We needed it now, we needed it a month ago. I've lost my phone, my car." Crespi who is bi-polar and has schizophrenia needs a disability check from the U.S. Department of Veteran Affairs, money documents say he's entitled to. "I asked the VA today, what more can I do? They said there is nothing more you can do, you've done everything you can do. It just wasn't acceptable to me," says Crespi. How this all started is Crespi received a disability check for all of last year for $5,300. But because he has credit problems his bank would only accept a maximum deposit of $5,000 so the bank sent the check back to the government. Now the U.S. Department of Veteran Affairs has his check, but is suspending his payments. Crespi says they asked him that. "They didn't have an answer." "I feel like they're getting screwed, they're getting screwed. They're being played with by the system," says Shirley Phillips. Phillips is their landlord and she says their rent was due four weeks ago and she's run out of options. "The bottom line is I have to evict them and put them in the street." Crespi didn't know what to do. "We called you," says Crespi. We put him in touch with Congressman Connie Mack's office. They say they'll try and help. Regardless, Crespi still has a rent payment due and right now has no money to pay it. WINK News contacted the local chapter of veteran affairs here in Lee County, they said our best bet is through the national office. That's who Congressman Connie Mack is working with. As soon as we hear something on this story we'll let you know. I called Connie Mack's office here in Florida and was told they are working on helping him. Let's just hope they are doing all they can for him. He did all he could for us. If anyone out there has any extra money, contact the station and help him out. Jim Eldridge, an East Lynn resident and Marine veteran of three tours in Iraq. By Thor Jourgensen / The Daily ItemLYNN - After three tours in Iraq where he was wounded twice, Jim Eldridge returned home in 2006 to his family and, eventually, a job. He knew he was lucky, but he was also angry. "I didn't have any options. Coming out of the infantry, my skills were very limited. "He relocated from California where his wife, Kasey, lived while he served in Iraq to Lynn where his father, Lon, and mother, Susan, welcomed the couple into their East Lynn home. Eldridge hoped he could follow his father into the city Public Works Department, but there was no job available. His father and city Veterans Director Michael Sweeney steered Eldridge to the River Works where a Vietnam era veteran interviewed him and offered the Marine sergeant a job. "With me, it worked out, but a lot of others are not so lucky," Eldridge said.Eldridge wanted to be a soldier since the age of three. He joined English High School's Marine Junior Reserve Officer Training Corps and headed for Parris Island and boot camp after graduating. As a Marine, he learned to do his job and the job of the man or woman standing beside him. As a Marine sergeant, the people under his command stood when he walked into a room and did their jobs without him having to tell them what to do. I was born and raised in Massachusetts where I lived until four years ago. 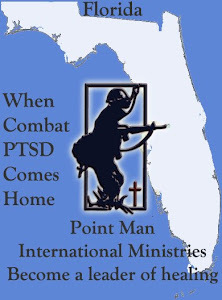 Now, living in Florida, I continue to do outreach work with veterans as a volunteer. After 25 years of focusing on PTSD, I can tell you that this is just the beginning of what is to come. Veterans face homelessness for several reasons. One is Post Traumatic Stress Disorder as well as the other problems that come with it. When they want to kill off the symptoms of PTSD, many self-medicate with alcohol and drugs. We turn around and call them drug addicts and alcoholics because it's easier than figuring out why they weren't that way before they face the carnage of combat. When they have endless nights of nightmares as real as what they went through and cannot get up off the sofa to go to work because they are so drained, we call them lazy and a bum, because that's easier than noticing the fact they were not lazy before they went. We also don't want to notice the fact while they were deployed they spent 24/7 on edge and on hyper alert. We don't want to face a lot when it comes to them and take the easy way out by blaming them for the changes in them. Some end up homeless because they can't keep jobs while others because they cannot get jobs. It's not always PTSD problems. Do we put them at the front of the line out of gratitude for their willingness to lay down their lives for the sake of this nation? No, it's easier to find reasons to not hire them so that they don't "give us any problems" or end up being redeployed. Eldridge is right and it shouldn't be so hard but until people start to see them for what they are, it will remain hard for them. We have over 300 million people in this country yet less than 30 million are veterans and only about 17 million of them are combat veterans. You'd think the rest of us could at least take care of them but we don't. They are a rarity to us and it's about time we acknowledged exactly how much they have to offer us at the same time we acknowledge how much they need our help. CHICAGO - Illinois is the first state in the nation to launch a brain injury screening program for all its National Guard troops returning from combat and a 24-hour hot line to help veterans with battle-related stress. The Illinois Warriors Assistance Program is designed to plug gaps at the federal level in care for soldiers returning from Iraq and Afghanistan, state Department of Veterans Affairs Director Tammy Duckworth said Tuesday. The confidential hot line addresses the stigma that a veteran in crisis may want to avoid, Duckworth said. "When he wakes up in the middle of the night, like I did for many nights, and you're shaking and it's 2 a.m., you can pick up that hot line and reach a clinician," she said. 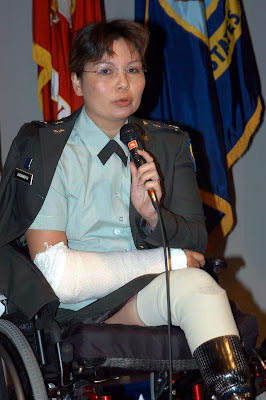 Duckworth, an Iraq veteran who lost her legs in combat, and Gov. Rod Blagojevich launched the program Tuesday. The state has received phone calls from 27 other states interested in using the program as a model, she said. The $8 million program will screen returning Guard troops for traumatic brain injury, known commonly as concussion, and post-traumatic stress disorder. When Tammy Duckworth returned from Iraq to Illinois, she was still on a mission. 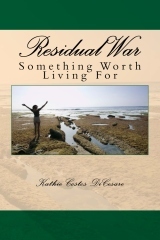 This mission had her just as concerned for the welfare of her brothers and sisters in uniform. She decided to take on the status quo and make a real difference. Since her voice was heard by Governor Blagojevich, Duckworth has been getting mountains out of the way of the wounded coming back. From PTSD to TBI, she has been a warrior in action. This kind of dedication is what it will take to actually become a grateful nation that does in fact take care of our wounded veterans. She is doing it all right. From the emergency call in center, this provides anonymity to the veteran. They can call in the middle of the night because that's when it is the worst for the majority of them. They wake up from dreams as real as the event itself. It's all there from the sites, voices and other sounds, the smell and the fear all combined with the carnage they witnessed. Sometimes the dreams are even more devastating than the event. They are also afraid of being labeled "crazy" while often they will say "If anyone knew what was going on inside my head, they'd lock me up" simply because they don't understand this is all normal reactions to very abnormal events. On the other end of the phone they hear a calm, reassuring voice telling them it'll be ok. The next step is getting them the help they need. This is what I've been doing for years. Out of the 25 years of veterans outreach, the last 10 have been online. They find me when they are close to suicide. I'm one person. I can't be there in the middle of the night for them. Often when I open up my emails their emails are buried in about a hundred others. By the time I read them, I say a prayer responding that they are still alive to answer. There have been times when they never responded to my reply. I often wonder what happened to them. When they do write back, it's a series of emails flying back and forth until I get them to know what PTSD, what is normal in all of this and try to get them to the point where they are ready to go for help. It's hard to walk a fine line between needing to back off to give them time to digest what's happening and being concerned for their safety. When I don't hear from them for a day or so in this process, I usually type out a "just checking on you" short email. Once they get into the help they need, I usually don't hear from them after that but occasionally they'll email to let me know how it's going. It's a take a deep breath time at least six times a day. This is why the call centers are vital to keeping them alive. To loose more after combat than we do during it, is pathetic. It is a statement that we as a nation have done very little when it comes to addressing the threat to their lives following them home. They are not "crazy" and most of them are not even addicted to the drugs and alcohol they use. For the most part they are trying to kill off the flashbacks and twitches. Once treatment begins, most never touch the stuff again. They are not criminals and don't like breaking the law, but with PTSD comes very irrational actions usually combined with seeking relief. Most of the crimes we read in the paper can be connected with post combat stress. The tragic fact is if the help was available to all of them, especially considering they didn't have a criminal background, these crimes could have been prevented. This is not even discussing the problems associated with vaccinations they are given and some of the medication they are given to calm them down or help them sleep. I was speaking with a VA Doctor today and we were discussing what his program does, while this lead into what is not being done. The VA centers need to be up and running across the nation. 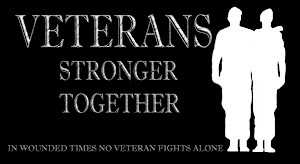 The VA and service organizations across the country need to begin to do support groups for the families to stop the family from falling apart during a time when the veteran is in the most need of their support and understanding. 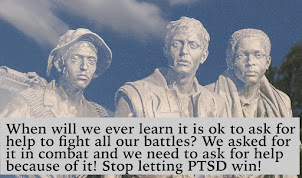 I don't know how many times I've posted that had I not known what PTSD was, my husband and I would have divorced long ago. I had the tools to keep us together and get him the help he needed. Duckworth and Illinois understands this. The question is, does the rest of the country understand it enough? Keith Ryan Suicide In Pakistan worked for State Dept. Growing up in Hingham, Keith Ryan held his political beliefs so strongly that he seemed like a real-life version of a popular TV character who was considerably more conservative than everyone else in his household. "We used to kid when he was in high school that it was like 'Family Ties' - he was Alex Keaton," said Mr. Ryan's father, Bob, a sports columnist for the Globe. His political convictions brought Mr. Ryan into a career of federal service, which ultimately led to Pakistan, where he was an attaché for the US Immigration and Customs Enforcement agency, based in Islamabad. Mr. Ryan apparently took his life, according to the US State Department, and was found yesterday in his Islamabad residence. He was 37 and was about to return home to visit his wife and three children in Silver Spring, Md. "As anyone who has been confronted with the suicide of a family member can tell you, the only word to describe the sensation is devastated," Bob Ryan said. "We will always have questions." A 10th Mountain Division soldier died Jan. 28 after complaining of chest pains while on duty, according to a press release from Fort Drum, N.Y.
Sgt. 1st Class Ritchie A. Morgan, 41, was a food service noncommissioned officer assigned to 6th Squadron, 6th Cavalry Regiment, 10th Combat Aviation Brigade. Morgan was taken to Guthrie Acute Care Clinic in Watertown, N.Y., after he complained of chest pains. Life-saving measures were performed there before he was transported to Samaritan Medical Center, where he was pronounced dead. Morgan, a native of Murphysboro, Ill., joined the Army in September 1987. He served in Korea; Fort Carson, Colo.; Germany; Fort Stewart, Ga.; and Mission Viejo, Calif., before being assigned to Fort Drum in November 2003. His deployments include a six-month tour in Kuwait in 1998 and a six-month tour in Macedonia in 2001. Morgan is survived by his wife, who is at Fort Drum. The cause of death is under investigation. (LifeWire) -- Jo Hanna Schaffer's dog is more than a best friend. The 67-year-old Vietnam veteran, a former Army medic, suffers from post-traumatic stress disorder (PTSD), and three years ago, she decided to get a service dog, a Chihuahua named Cody. Cody barks if someone is approaching from behind and cuddles with her when she is depressed. "I never took a pill for PTSD that did as much for me as Cody has done," says the Billerica, Massachusetts, resident, who no longer takes medication for the disorder. Schaffer is one of a growing number of veterans with PTSD who are turning to an alternative therapy: psychiatric service dogs. For five years, Persian Gulf War veteran Karen Alexander, 52, of Pensacola, Florida, has relied on Cindy, a Bernese mountain dog that can sense when Alexander is having an anxiety attack. "She'll come up and touch me, and that is enough of a stimulus to break the loop, bring me back to reality," says the retired Air Force captain. "Sometimes I'll scratch my hand until it's raw and won't realize until she comes up to me and brings me out. She's such a grounding influence for me." The use of service dogs for mental illness has emerged in the past decade, says Dr. Joan Esnayra, founder and president of the Psychiatric Service Dog Society. Esnayra coined the term "psychiatric service dog" in 1997 and has worked with thousands of people who are using the animals. She estimates that the society's online community is adding more than 400 members each year. VCS sends you three important items in this week’s update: 1) The President signed the "Dignity for Wounded Warriors Act;" 2) VCS testifies next week before Congress about VA’s budget; and, 3) An enormous mountain of evidence shows conclusively that the President lied to start his failed Iraq War. First, on Jan. 28, the "Dignified Treatment of Wounded Warriors Act" was signed into law by the President after intense advocacy work by veterans. VCS members worked very hard to pass the new law. VCS worked with two groups to make this happen: "Empowering Veterans" and "Veterans and Families for Military Progress." Now we need to make sure the law is followed. Second, On Feb. 7, VCS will offer facts and common sense policy solutions when we testify before Congress. VCS will ask that VA stop making veterans wait for medical care and disability benefits. 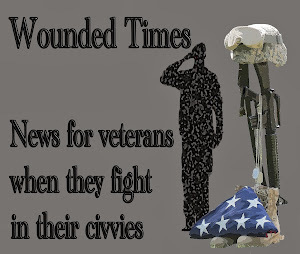 Please send VCS your ideas on what we should tell Congress on Feb. 7: Paul@VeteransForCommonSense.org. Third, a new report thoroughly documents how President George W. Bush repeatedly lied hundreds of times to start his lost Iraq War. In March 2003, VCS wrote the President and challenged his assertions. We remain correct, and the President continues to be disastrously and completely wrong. We fought and won the battle for the Wounded Warrior bill, we will be testifying before Congress again fighting for veterans, and we are challenging the many serious policy failures of the current administration. VCS needs your financial support to keep up the fight. We set a new record of $16,000 in donations last month, including one contribution for $10,000. However, our January 2008 donations remain low. Please honor Thomas Paine’s 271st Birthday today by donating to VCS so we can continue our publicity and policy efforts on issues we care about – veterans, national security, and civil liberties. Your generous donation of $30 or $50 helps VCS with our on-going class action lawsuit against VA so that no veteran is forced to wait. With your help, we can hire more staff and win more victories for veterans. If I wasn't out of work, I'd give them a big fat donation! Their work is very important and expensive. They cannot work for free. Heck, at this point, I can't either, but this is not my job. It's my passion! WASHINGTON, D.C. -U.S. Senator Daniel K. Akaka (D-HI), Chairman of the Veterans' Affairs Committee, and Senator Bernard Sanders (I-VT), a member of the Committee, sent a letter this week urging the Department of Veterans Affairs to dedicate additional funding to the National Center for Posttraumatic Stress Disorder (NCPTSD). Congress last year passed an unprecedented budget increase for VA in Fiscal Year 2008 which included funds for the NCPTSD. 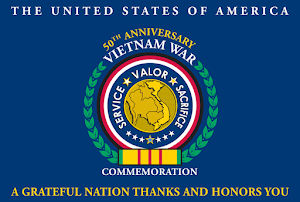 In their letter to Secretary of Veterans Affairs James Peake, Senators Akaka and Sanders called for an additional $2 million for the NCPTSD above the previous year's funding level. The Center is a leader in research and education on PTSD, and provides clinical tools and guidance to clinicians around the country. "The National Center for PTSD continues to make valuable contributions to the understanding and treatment of PTSD, and America's veterans are better off thanks to their work. Additional funding will enable them to address critical issues and facilitate better care for veterans. It is my hope that Secretary Peake will support the Center for PTSD with adequate funding in the years to come," said Chairman Akaka. In recent years, the Center for PTSD has been called on to dramatically expand its mission and conduct research on a larger scale. At the same time, an increasing number of servicemembers are returning from Iraq and Afghanistan with PTSD. However, the Center's budget has increased by less than 10 percent in the past half-decade. Due to limited funding, the Center's capacity to continue its work is severely restricted, and staff levels have been reduced since 1999. "I can't tell you how angry we all are and how frustrated we all are. Nothing angers me more than when we don't do the right thing," Kussman told reporters during a conference call after releasing findings of the VA's investigation and summarizing a separate inspector general's probe. This makes Bush's speech like a very bad B movie script. Sgt. Tracy Renee Birkman, a mechanic and mother of three from the Roanoke area, died Friday after suffering non-combat-related injuries in Owesat, Iraq, according to military officials. The incident is under investigation, they said. She is survived by her parents and three sons, all of New Castle, Va., according to officials from Fort Campbell, Ky., where her division, the 101st Airborne, is based. Birkman's father, Jerald Griffith, a veteran of the Vietnam War, said his daughter was on her third deployment to Iraq. "She's over there in a war we shouldn't even be involved in, on her third tour," Griffith said. He said he was angry with military officials for releasing information about his daughter's death, and with the media for its portrayal of soldiers such as himself. "I didn't want it released. I am so [furious] about all this I can just scream," Griffith said. "I hate the media with just an unmitigated passion. You . . . lied about me when I was in Vietnam." FORT CAMPBELL, Ky. — A Fort Campbell-based soldier died Friday of non-combat injuries in Owesat, Iraq. Sgt. Tracy Renee Birkman died, 41, of New Castle, Va., was assigned to the 626th Brigade Support Battalion, 3rd Brigade Combat Team of the 101st Airborne Division. Also this weekend, two soldiers were killed in separate bombings in Baghdad, the military said Sunday. A Multi-National Division-Baghdad soldier died Sunday after the soldier’s vehicle was struck by a roadside bomb in northeastern Baghdad, according to a statement. I'm sitting here in tears. Oldtimer Speaks Out has at least one story a week that does that to me. Perry got up in the middle of the sermon and started for the pulpit. Scott caught up with him and asked what his intentions were. “I’m going to make an offering”. ”But wait, there is a time for that later”, said Scott. “But I want to give now!” So Perry took his Chucky Cheese gold token to the alter and placed it on the corner of the choir railing, and returned to his seat just beaming! Grinning from ear to ear. 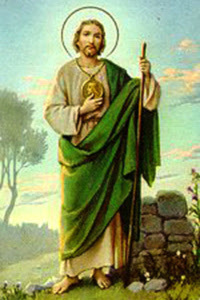 Gave all he had, real gold to him. I don’t know what happened to Perry when the evictions came. I think that he had dissappeared. We know of one death, Dominic, and we know that there is likely more - I learned today that the medical examiner sent a homeless person to a funeral home near our church who was apparently found in the same lot we were serving, but Dominic had been found somewhere else. The pastor was wrong because the woman didn't give one coin, but she gave two. That was all she had and it's been said this gesture is the basis for the saying "putting in my two cents" when we offer our opinion from all we have in our mind. This would be a wonderful world if we all put in our two cents. When we take compassion on those who have less than us even though we have very little of our own, we prove that we are grateful even for crumbs. When we set ourselves aside for the sake of someone else, that is what Christ was talking about. It wasn't just being willing to lay down your physical life, but to be willing to set aside focus on your own life because someone else is in need. Some may just need a shoulder to cry on, when you are dealing with your own pain. Some may need clothing when you are trying to figure out how to afford to buy the new coat that's on sale and you really want it. You may remember a time in your life when you were eating cereal twice a day because it was a lean month of income but a huge month for bills. You carry on your back those tough days and feel compassion for someone else knowing how much it does hurt to be broke and in need. For the homeless, especially the homeless veterans dealing with other issues, they live lives as outcasts. Their families have sent them away, refusing to take care of them, or they themselves decided they didn't deserve their families and vanished into a world of wondering. When we see a homeless person the first thought that comes into our mind is to not look at them. If we turn our heads, they won't come close. They won't ask for money. Horror overcomes us if they dare approach. Why is that? Is it that we fear they will try to harm us or we may catch something from them? That's hardly likely. Are we afraid we may need the change in our pocket or that they will use the buck and half we give them to get drunk with? What business is that of our's? We won't know if they eat or not unless we take them the food or take them to the food. What about clothing? Do we have a yard sale so we can make some money on what we no longer want to own? Or do we decide to donate the clothes we don't need to someone who does need them? I donate mine. The Vietnam Veterans just picked up bags of clothes that filled my closet I hardly ever wore. No, I didn't go through my closet with them in mind. I did it because I'm a slob when it comes to my closet. My bureau is virtually empty because I'm too lazy to put the clean clothes in draws. It's a lot easier to just stack them on a shelf in my closet. It was purely selfish because I got to the point where I couldn't find anything and didn't have room to hang anything up. So I packed up what I never get around to wearing and donated it to the vets. I figured the clothes weren't doing me any good and cleaning out my closet helped me to find some of the favorite pieces of clothing I haven't been able to find in months. What about a kind word? Can we manage to say a kind word to a homeless person? Do we even know how they became homeless? We can assume they must deserve to be homeless and then we won't have to face the fact we provide clothing, footwear, shelter and meals to prisoners. We can assume they want to be homeless and then we won't have to face the fact that if they want to be homeless there has to be a reason behind it. Would you in your right mind ever seek to be without anything? We humans decide who we will judge, who we will help and what we will do while most of the time it's purely out of self interest. Some people will act as if they are doing it for the sake of someone else when what they really want is for people to see them doing it. That is what we think isn't it when we see someone at a feeding table on Lake Eola in Orlando. ORLANDO, Fla. -- More than 20,000 military veterans in Florida are homeless, living in a kind of war zone they had never imaged -- on the streets and in the woods. A former U.S. Marine named Pete who once lived in Cocoa Beach with a great view of the ocean is now one of Central Florida's 1,400 homeless. Pete lives in the woods. "I got a tent in the woods. I'm not going to a shelter," Pete said. "I'm a carpenter by trade and I just need to get back to work." Now we can just ignore them, walk by them, avoid them, but they won't go away. As a matter of fact, if we ignore them they will increase in numbers. They already have. 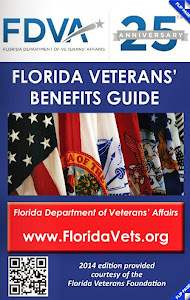 20,000 homeless veterans in Florida when the last time I checked the numbers it was 14,000. We have 1,400 in Central Florida alone. The Dom in the VA center only has bed for 60. There are other beds scattered across the area but there are not enough of them. What we really have to be aware of is there are homeless the VA doesn't even know about. One of their stories was posted on this blog because of a comment made by the wife of a disabled veteran who lost everything because he was wounded and cannot work but received a zero percent disability. They are living with a relative. We can only assume this is the case here in Orlando as well. While we may be horrified by the numbers we know about, we need to always retain the fact there are more. I think having homeless people in this nation is a sin. While we can give huge tax breaks to oil companies sucking our wallets dry at the pump, breaks for businesses looking at the bonus money they make by laying people off, the result is suffering for the many for the sake of the few. Still even with this, my heart is tugged by the veterans. They were willing to lay down their lives for this country and we do owe them a debt of true gratitude. We owe them to not be homeless. I posted about this many times that if we can't even take care of them, the chance of the regular citizens to be taken care of is highly unlikely. Next time there is a meeting you attend or you hear about a homeless person being blamed for their state, put in your own two cents and set the record straight. Maybe a homeless man like Perry will get you a gold coin in heaven for helping him when he was the least among us. A corporal faces court-martial in the death of a deployed Gordon Marine reportedly shot in the neck. Lance Cpl. Kristopher Cody Warren died Nov. 9, 2006. The Marine Corps is calling the 2006 death of Calhoun native Cody Warren negligence and has charged another Marine in his death. Lance Cpl. Kristopher Cody Warren, 19, was killed Nov. 9, 2006, while his Marine Reserve detachment was deployed in Iraq. 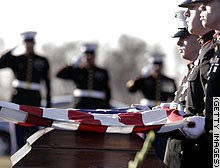 Click here to read a previous report: "Gordon mourning Marine. At the time, Warren’s death was listed as “non-combat-related,” but the Marines now have charged Cpl. Douglas Michael Sullivan, who was assigned to a military police unit at Camp Pendleton, Calif., with culpable negligence, authorities said. A Pentagon spokeswoman, Lt. Col. Ellen Krenke, confirmed the bonuses had been canceled, saying they violated Pentagon policies because they duplicated other programs. She said Guard and Reserve members would be eligible for other bonuses. As the suburban Johnstown-based Pennsylvania Disabled Veterans Rehabilitation/Vocational Retraining Project enters its third year, Tom Caulfield, director of Veteran Community Initiatives, believes the program is growing in influence. “I think we’re really starting to make an impact,” said Caulfield, who is coordinator of the rehabilitation/vocational retraining project. The project is sponsored by VCI and Hiram G. Andrews Center, both at 727 Goucher St. in Upper Yoder Township, and the University of Pittsburgh’s Department of Rehabilitation Science and Technology. 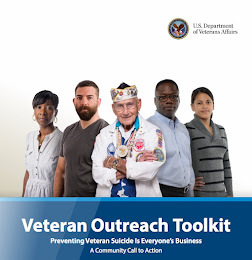 The purpose of the project is to provide physiological, psychological, vocational and employment assistance to veterans of Operations Iraqi Freedom and Enduring Freedom. Enduring Freedom is the designation given to U.S. operations in Afghanistan and surrounding regions. Caulfield said that PDVR/VRP has been working with providers of treatment for soldiers suffering from Posttraumatic Stress Disorder (PTSD), plans to reinstate veterans rap sessions and is considering extending its readjustment counseling efforts. He said an increased emphasis is being placed on issues and needs relating to families of those in the military and those who have returned home. Piece of advice, use videos. The VA warned its own doctors Wednesday that the drug "may rarely be associated with certain long-term chronic health problems that persist for weeks, months, and even years after the drug is stopped," according to a summary of published studies by a VA panel of experts. The summary accompanies an "information letter" from the VA's acting undersecretary for health, Dr. Jonathan B. Perlin, to healthcare professionals who treat veterans.Veterans' advocates praised the VA but said the Pentagon seems to have lost track of who has taken the drug -- making the size of a potentially serious problem unclear.While little mefloquine was used in the first Gulf War, advocates said a similar dearth of medical data has thwarted efforts to get to the bottom of Gulf War Syndrome for a decade. Investigators simply did not know what drugs or vaccines -- possible contributors to that syndrome -- were given to solders. "We are pleased that the VA is taking a proactive approach to this situation," said Steve Smithson, assistant director of the American Legion's National Veterans Affairs and Rehabilitation Commission. "It is no secret that the military did not do a good job of record keeping in the first Gulf War," said Smithson. "Early reports on Lariam make me concerned that we did not learn the lessons from the first Gulf War in that it is not being documented in health records." But last Christmas, only months after the initial wave of killings, Fort Bragg was again the scene of tragedy when another service member, Sgt. Marvin Lee Branch, allegedly tried to murder his wife. How the situation was handled is indicative of the larger problem. Restraining orders protecting Carol Branch were dismissed within weeks of the attack, and she complained of receiving very little support: "I'm trying to save my life and I've got to beg (the Army) for help? I can see how those other mothers died. They were trapped." Branch said her husband had a history of abusive behavior, but he became uncontrollably violent upon returning from duty in Afghanistan. An Army spokesman confirmed that soldiers in Sgt. Branch's unit had taken Lariam, but would not confirm whether Branch had as well. CHARLESTON, Ill., Feb. 21 (UPI) -- The lawyer for a former Marine convicted of murder will tell an Illinois jury next week that an anti-malaria drug associated with psychotic behavior and aggression triggered the killing, and he should be spared the death penalty. And my personal theory of what lay behind those horrible, horrible murder suicides at Fort Bragg a couple of years ago, these were all staff NCOs … and officers in Special Operations, which is the most macho of all the formations. And what's more, they had been deployed repeatedly into very dangerous, very confusing and ambiguous operations, and had come back with injuries that they could not ask for help with, because they were afraid it would end their careers. And just by coincidence, a number of them broke at the same time, and broke in this catastrophic way. That's my thought about what happened there. This is not likely to be happening with junior enlisted people who I think can get help. Fayetteville, N.C., police said that was when Sgt. 1st Class Rigoberto Nieves — a soldier in the 3rd Special Forces Group who had been back from Afghanistan just two days — shot his wife, Teresa, and then himself in their bedroom. Sheriff's investigators said Jennifer Wright was strangled June 29. Her husband, Master Sgt. William Wright of the 96th Civil Affairs Battalion, reported her missing two days later. Then on July 19, he led investigators to her body in Hoke County and was charged with murder. Wright, who had been back from Afghanistan about a month, had moved out of his house and was living in the barracks. The couple met in high school in Mason, Ohio, about 30 miles north of Cincinnati. They married shortly after Jennifer graduated. Her father, Archie Watson, said the Wrights had talked recently about divorce. 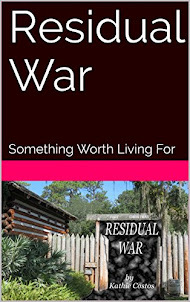 Jennifer had grown tired of military life, her father said, but William Wright was reluctant to let her go. Sgt. 1st Class Brandon Floyd shot his wife, Andrea, a native of Alliance, Ohio, then killed himself in their Stedman home. The Fayetteville Observer reported Floyd was a member of Delta Force, the secretive anti-terrorism unit based at Fort Bragg. He returned from Afghanistan in January, officials said. The couple's three children were in Ohio visiting relatives at the time of the deaths. In the fourth case, Army Sgt. Cedric Ramon Griffin, 28, was charged with first-degree murder, two counts of attempted first-degree murder and first-degree arson in the July 9 death of his wife, Cumberland County Sheriff Moose Butler said. Marilyn Griffin, 32, was found dead in the burning home. Her two children escaped the fire. One of the soldiers was "almost incoherent" and visibly shaking while describing marital problems to a neighbor. Another became unable to control his anger at his wife in public, startling those who knew him. A third puzzled his new neighbors with his strange behavior. Read and comment on this story from UPI on the Army's three month study the slayings of four Army wives at Fort Bragg this summer which concluded that Lariam was not a factor in the murders. The report has sparked claims the military is covering up problems with a drug it invented and licensed. "Our military said there is no problem with (Lariam) because they developed it," said Rep. Bart Stupak, D-Mich. "The hardest thing to do is develop a drug and then admit there is a problem." Lariam is the most effective anti-malarial drug known and has been used by thousands of Peace Corps Volunteers over the past ten years. However, the drug's potential side effects are rarely reported and include agitation, depression and aggression. In July, Sen. Chris Dodd, D-Conn., called for an independent medical investigation to protect the health of Peace Corps volunteers, who are routinely prescribed the drug.